A client called me yesterday for a quote. He has mold on his stucco exterior siding (that has never been painted) and some of that mold is black. The problem originates with the stucco porosity. The porous surface absorbs water indeed; stucco absorbs water like a sponge, and then lets it go gradually. This is how mold appears. 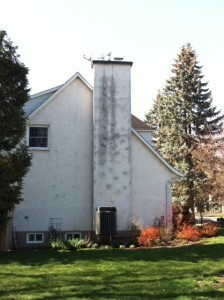 As the image shows, the mold has blackened on the chimney and on a few other spots on the house. The blackness is more pronounced when it rains and then it gradually disappears when the surface dries. This house has green and black mold on the other façades. What to do? Will a good cleaning do it? No. The blackened spots will stay black and the mold will return quickly. The only thing that could make it all go is hydrochloric acid but it is damageable for the environment and it would have to be repeated each 3 to 6 months. The solution that I suggest is pressure washing the surface and repainting it, this way the surface porosity will lessen and it won’t absorb the water as much. Thus the mold won’t form as easily. Will the paint adhere well on the stucco, or will we have to repaint often? In fact, it’s not that bad! There are some high-tech paints on the market which are so efficient and adhere so well, that your exterior paint could be good for 20 years! The important details that you need to know is to choose a 100% acrylic paint which has a low-gloss (matte finish paint). Low-gloss will help the water sliding on the surface instead of being absorbed so the mold won’t form easily.